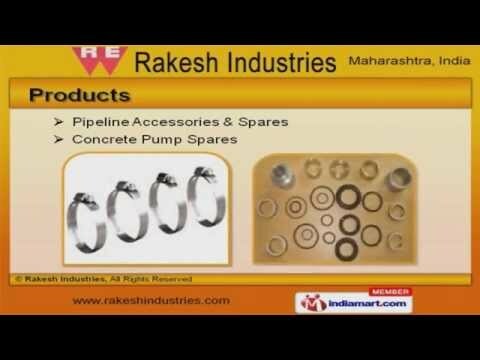 Welcome to Rakesh IndustriesManufacturer & Supplier of Pipeline Accessories and Spares PartsThe Company was incepted in 2011, at Vasai. Our State-of-the-art infrastructure help usto cater Indian Subcontinent. Shapurzi Palanzi & Sanjay Heavy Industries Pvt. Ltd. are some of our prestigious clientsand we are supported by Quality raw materials & Ethical business practices. Our team comprise of Technicians, Production Managers & Engineers. We offer a vast range of Concrete Pump, Pipeline Accessories & Spares. Pipeline Accessories & Spares offered by us are widely appreciated in the market. Our Industrial Cupboards & Tapper Pipes are best in the industry amongst others. We also provide Concrete Pump Spares that are available at affordable prices. Along with that we offer Concrete Pumps Pistons & Sponge Balls that are a class apart.